Kvisoft Flipbook Maker Pro is a famous page turning software, specialized in creating Flash & HTML5 page flipping magazines, brochures, catalogs etc from various documents: PDF, Word, Excel, PowerPoint, images and more. Users can embed media elements such as text, links, images, video gallery, YouTube, shapes etc to flipping pages to make interactive e magazines. Any computer, iPad, iPhone, Android phone readers can browse the flash&HTML5 page flipping e-magazines online with comfortable reading experience. Kvisoft FlipBook Maker Pro, a helpful Flash&HTML5 page turning software, offers you a professional but easy way to design 3D animated flipping page publications from PDF, Microsoft office documents, images and flash movies. A nice PDF to SWF flash program for anyone to generate digital publishing creations like digital magazine, flip catalog, page turning ebooks to enhance business presentations. Kvisoft digital magazine software can enable you convert PDF to HTML5 page flipping magazine which is of high compatibility with all popular mobile devices: iPad, iPhone, iPod Touch, Android and other portable devices. Your readers can watch videos, browse images, listen music, click links etc on mobile devices just as perfect as reading page turning publications on computer. To adapt for readers of different countries, you must need to create a multi-language publication. You can import different language versions of a marketing document into Kvisoft FlipBook Maker Pro, then it will generate a multi-language magazine. So your readers can switch to native language version for easier reading and operating. This page flipping software can convert images, SWF, flash videos and common doc files(PDF, Word, Excel, PowerPoint) to dynamic 3D flash magazines for more impressive and effective online & offline sharing. You don't need to know any flash scripts to design a professional e-magazine to deliver your tips, brands, products and story to the worldwide. In order to show more relevant information about your flipping digital publications, you can make full use of the bookcase feature of Kvisoft e magazine creator. Set the URL and thumbnail, you can easily put similar ebooks or content together on a bookcase to bring your audience a shortcut to know more about your company, products, discounts etc which can increase your brand visibility or ebook sales. Kvisoft Flipbook Maker Pro can enable users to create interactive flash flipping magazines with embedded rich media elements such as dynamic text, bubbles, image gallery, flash, local movies, YouTube video, music, Flickr pictures etc with only easy drag and click. You can communicate with your potential clients more pleasantly and clearly with comprehensive illustration means: text details, iconic images, video demos, dynamic flash etc. The rich-media flash flipping digital publications will lead more visitors to your website or online store. Kvisoft PDF to flash magazine converter supports various publishing formats: flash-based HTML, HTML5, standalone SWF, EXE, APP, Screensaver and video. You can present your business information in front of worldwide people via web version flash magazines, HTML5 mobile version(iPad, iPhone, iPod, Android devices and other portable devices) page turning ebooks, executable Mac App , CD delivery, Screensaver and other types of turning page publications. It's easy to make a 3D page-flip magazine which is accessible for PC and mobile users, online and offline readers, Windows or Mac users. What you see is what you get. Once you selected a template or customized a setting, you can preview the settings and edits from the preview panel in real time. Besides, Kvisoft digital publishing software allows you preview the appearance, template, layout etc of your flip magazine before you actually output it. The powerful preview feature can even simulate the real look and effect what the flipping page magazine looks like on phones or Pads. In Brand Settings, you can add logo/brand along with a clickable link to your page-turn publication, so your audience will be noticed of your logo and brand. In Main Settings, you can name your publication with a special title and link it to your website. This can not only build brand awareness, but also drive more traffic to your website or web store. Bookmark: ebook author can add bookmarks on specific pages to show their audience the most important news or information; ebook readers can also make their own bookmarks to make notes etc. Table of Contents: ebook author can make a HTML5&flash flip magazine with table of contents so that readers can navigate to specific parts or chapter with only a click. Kvisoft PDF flipping page software provides dozens of free yet stunning templates for users to decorate digital magazines. Besides, you can customize nearly all settings like background color and music, toolbar language, cover style, page flip speed, page spine curvature, toolbar buttons and so on. It offers you a chance to customize a stunning magazine which is consistent with your own style, company culture and customer orientation. The digital publications can be integrated with popular social networks. Readers can easily click to share your digital publishing work to their families, friends and colleagues via Facebook, Twitter, Ask, Blogger, WordPress, MySpace and etc. This will help you distribute your page turning ebooks or business publications to more people for engaging sales. 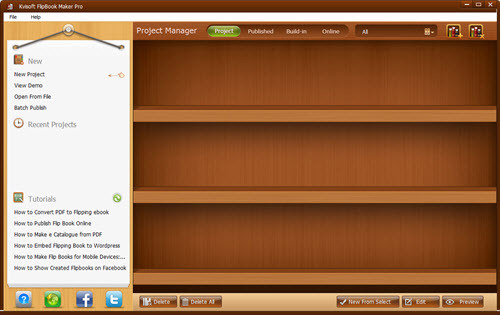 The project manager of Kvisoft PDF turning page software can save your current and previous projects on bookshelf and sort them by category. So you can quickly access to them for further edits, check, customization etc. Kvisoft FlipBook Maker Pro 4.0.0 from rapidshare mediafire megaupload hotfile, Kvisoft FlipBook Maker Pro 4.0.0 via torrent or emule, full free Kvisoft FlipBook Maker Pro 4.0.0, Kvisoft FlipBook Maker Pro 4.0.0 rar zip password or anything related.